Glow-in-the-dark carbon fiber is now gracing the handle of the popular Hinderer designed and Zero Tolerance constructed 0393 flipper. 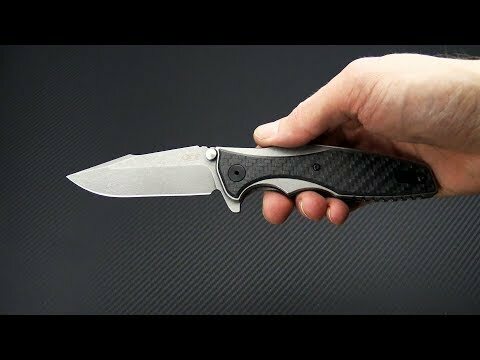 This iteration of the ZT 0393 has all of the same features you had grown to love on the original while also boasting a few upgrades. Titanium frame, glow carbon fiber and CPM-20CV blade are just a few of the highlights on this everyday hard use style knife. 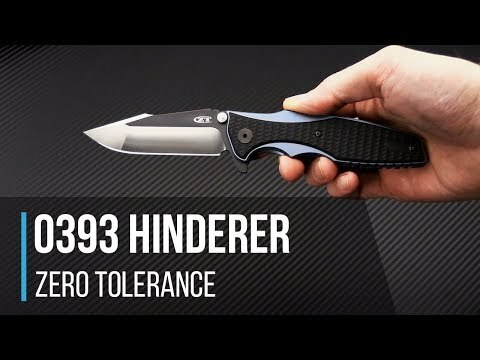 Brand new directly from Zero Tolerance. The Blade: The Harpoon Spanto blade has clear Hinderer influence from the grind and name to its rugged working finish. Riding on the KVT ball-bearing system, the CPM-20CV blade can be effortlessly deployed with a push on the integrated flipper. Razor sharp and ready for action, the blade shape lends itself well to hard use tactical tasks and everyday simplicities alike. Notched jimping above at the thumb rest and along the flipper provide added traction. The Handle: Two slabs of titanium were machined to form the handle on this ergonomically freindly folder. With two primary finger grooves and additional notched jimping along the belly, you are guaranteed a solid and secure grip in both bare and gloved hands. A titanium frame lock mechanism with steel lockface insert can be found on the backside of the knife offering both solid and smooth lock-up. The handles have also received the working finish treatment to match the blade and are then complimented with smokey carbon fiber overlays. And this is no regular carbon fiber! While it may seem unassuming in standard lighting, the carbon fiber glows in the dark when activated. The 0393 is completed with Hinderer-style standoffs and a black coated, reversible (tip-down) stainless steel pocket clip for carry. About CPM-20CV: A highly wear resistant, powder metallurgy stainless tool steel, the steel contains a large volume of extremely hard vanadium carbides which provide excellent wear resistance. CPM-20CV contains the highest amount of chromium of any high-vanadium stainless steel currently available. The chromium-rich matrix provides outstanding corrosion resistance.